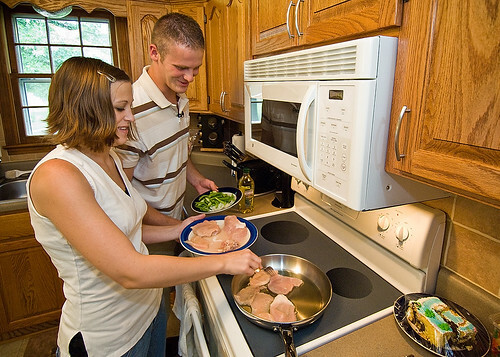 Christopher and Natasha Goetz preparing dinner in their home in Garnett, Kansas. By 2005-08, total fat accounted for 30.5 percent of calories in foods prepared at home, compared with 37 percent in away-from-home foods. This post is part of the Science Tuesday feature series on the USDA blog. Check back each week as we showcase stories and news from USDA's rich science and research profile. With restaurant and take-out meals an everyday occurrence for many, the choices we make when eating out can have a big impact on our health. Federal surveys find that Americans, on average, get 32 percent of their calories from foods ordered from restaurants, fast food places, and other away-from-home sources, up from 18 percent of calories 30 years ago. At the Economic Research Service, we wanted to know how the nutritional quality of at-home foods compares with away-from-home foods, and whether the differences between them had changed over time. We compared data from Federal surveys conducted in 1977-78 and in 2005-08, each covering a nationally representative sample of Americans. The surveys reported types and amounts of foods eaten and from which sources—at-home sources, such as grocery stores, convenience stores, or supermarkets, or away-from-home sources, including schools and day care centers. We found that over the past three decades, positive nutritional changes occurred in the food Americans ate from home-prepared sources that were not matched when eating out. For example, total fat accounted for 40 percent of calories in both at-home and away-from-home foods in 1977-78. By 2005-08, total fat accounted for 30.5 percent of calories in foods prepared at home, compared with 37 percent in away-from-home foods. In 2005-08, “away” food was also higher in saturated fat and sodium, and lower in dietary fiber, than home-prepared food. In food obtained away from home, the nutritional quality varied, depending on where the food was acquired. For example, in 2005-08, fast food was the highest in saturated fat of all the “away” sources—a concern since consumption of fast food grew more than any other “away” source over the time period studied. For children, schools are an important source of “away” food. Total fat accounted for 34 percent of calories consumed in foods obtained at school in 2005-08, down from 40 percent in 1977-78. USDA requires that school meals include milk, an excellent source of calcium, with the result that foods obtained at school are more calcium-dense than at-home, fast-food, and restaurant foods. Nevertheless, the calcium density of foods obtained at school fell by 13 percent between 1977-78 and 2005-08, probably due to increased availability of less-nutritious non-USDA foods and beverages in many schools. We encourage you to explore more of the findings in our report, Nutritional Quality of Food Prepared at Home and Away from Home, 1977-2008. Is that pork she's frying in some kind of oil? Does not look very healthy just saying and the cake on the counter. Good thing the husband at least has green beans :-).